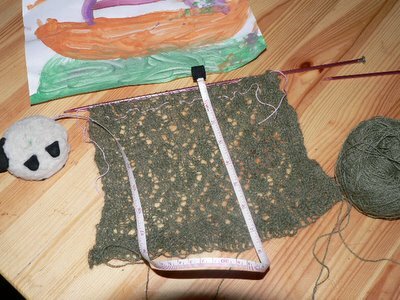 Given the nagging and threats gentle reminders of my friend Susan, what could I do today but begin Thing 1's leaf cable sweater in earnest? It's a fun pattern to work on, and one that I'm proud of assembling. My only concern is running out of yarn. This gorgeous green is, I think, from a bag labeled "wool yarn, 100% virgin wool mill ends hand knitting yarn, mill ends from one of America's most famous mills, brunswick yarns - pickens. s.c. 29671," and there's a circle with "1 lb. bag" in it. Wonder if I could find another bag of the same stuff? My wondrous yarn teacher in Tennessee gave it to me, and it must have been old then. The type face looks like it's from the 70s or early 80s. Ebay? What would you suggest? If, after weighing the back and the remaining ball, I don't think I have enough, I'll just have to (urgh!) 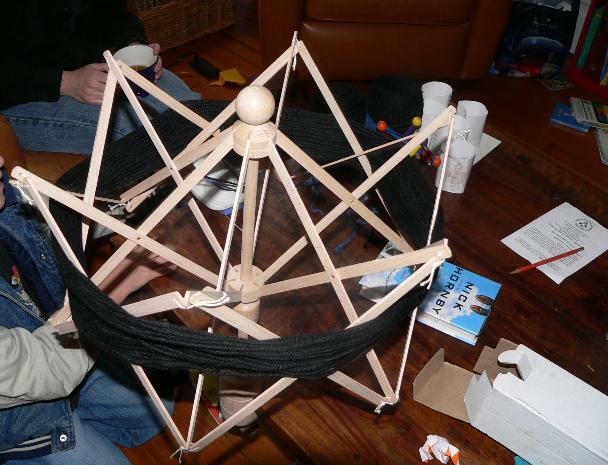 buy enough yarn to make it fully. After the baby pullover cuff fiasco, I don't relish the wondering and racing at the sleeves kind of feeling enough to repeat it. I hope you can see it. 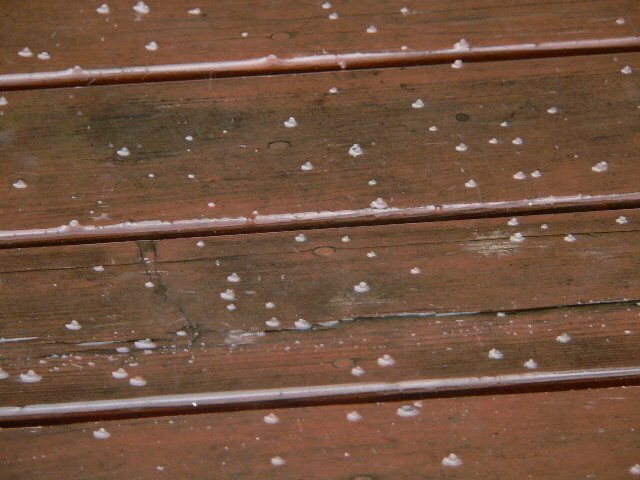 The little dots are hail on the back deck. 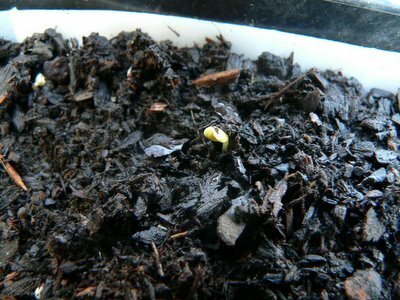 Yes, ask me how glad I am that there are little teeny seedlings in the flats and tomatoes in the garden. It cleared up and became warm and sunny, in keeping with the bipolar weather gods. All four Things and I rode the bus (great adventure when you're under 10 or so) to the library so I could insist that I had already returned the books they were currently fining me for. Of course, the books weren't in the library, so they refused to put them under "claims returned" status, which gives me one year to produce them, and just renewed them for an extended period. I did return two large bags of books to the great-but-far-away library this week. I guess I'll call them tomorrow and see if someone is scratching their head, saying, "Why do we have four Henry and Mudge books from another library system hanging out here?" By declaring myself finished after only the short program, "Dainty Bess" is done, a day before the Olympic deadline. Here is what I ended up with. For everyone who nicely told me that you couldn't really see the errors earlier, thank you. Don't bother with it again! 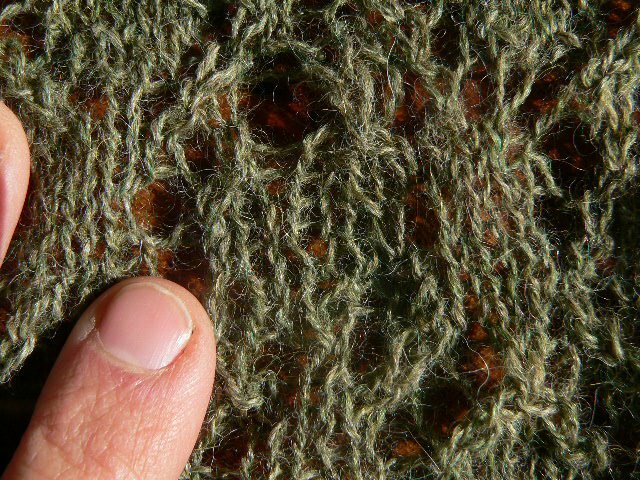 You can't see them unless it's spread out, and I plan to never do that to this bit of knitting again. I actually took an "artistically draped in the window" picture, but the errors were even more glaring in that, so no go for the blog. While I'm taking a few minutes to savor the good things (being done), I realize that it wasn't what I'd hoped I would get out of the event. I had hoped that I would enjoy doing lace, and I did. That was good. I hoped to demystify charted lace, and to an extent, it was. I had hoped to have a gift-worthy scarf at the end of the project, and I don't. I do have a teeny weeny neck ring, just enough to tuck into a jacket. It will fit perfectly into a pocket for storage, which is a plus. The baby seems to approve. It's already been co-opted (along with my orange cotton sweater) by Thing 1. I hear that this sort of thing only happens more and more often. If I could actually make a whole scarf, I'd probably never see it. 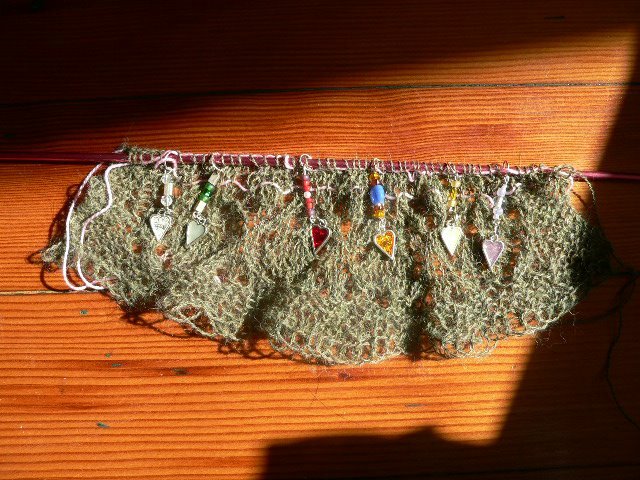 But it got kind of lonely, wandering around the Virtual Village with just my jazzy little neck ring for company, even after weaving in the ends. So I kind of entered another event. I don't think that walk-ons are allowed in the "real" Olympics -- a digression: I think the KOs were/are much more real. They were certainly more enjoyable, especially given NBC's hideous coverage stateside -- but if walk-ons were allowed, wouldn't it be fun if, say, bobsledders could go and try ice dancing? 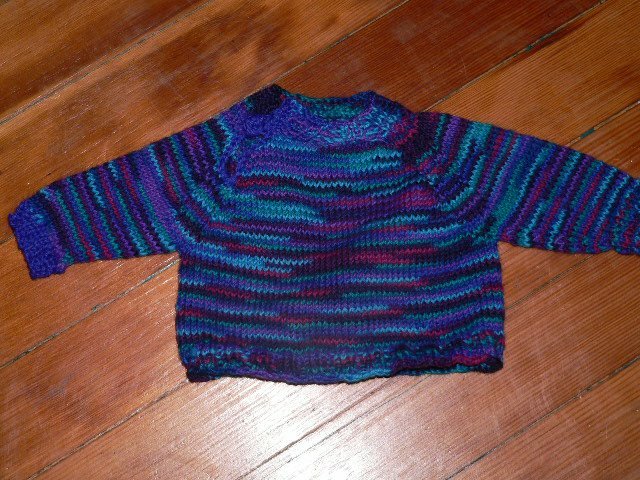 This was a pure sprint, one I'm calling either "Baby, It's Cold Inside," or "Whaddya Mean There's No More Yarn/Contrast Color Cuff Baby Sweater." Right now, it's being blocked. Just like the sweater I made using just too much the rest of this yarn, I knew it would lengthen to the perfect baby-torso sweater. I've been wanting to roughly use the top-down raglan calculator from Woolworks as a starting point for an open-shoulder baby pullover. So this one has (it's hard to see in the picture) a partially open raglan seam, so the humongous baby head can fit through. Then I used my version of single crochet to go around the opening and made a little loop, through which I put an i-cord bobble I made and sewed on. No button searching -- I was up against a deadline. Fortunately I had plenty of the body yarn from the earlier sweater, so one cuff is blue. This sweater took from some time Friday, with intermittent knitting until today, Sunday. I'm pleased, because our house is incredibly cold, after a brief unseasonable warm spell, and the little baby needs a sweater that fits. And is wool. Now she has one, and I can hold my knitting head up high. Until I decide what the next lace project is. You know that my back yard is undergoing a transformation. 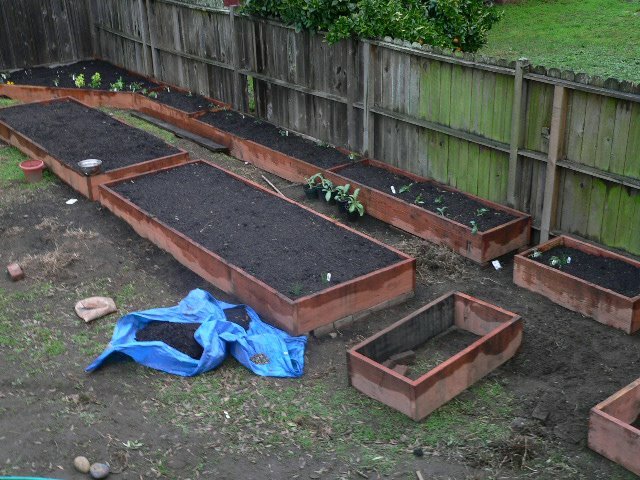 New garden beds, chicken prison, etc. Eventually there will be a play area, a lawn, and more plants. For now, though, there's just lots and lots of unallocated dirt areas. A neighbor said, "It looks like you're having. . . pipes put in your yard?" We had to say, no, it's just the kids digging. Here's the man behind the plan. 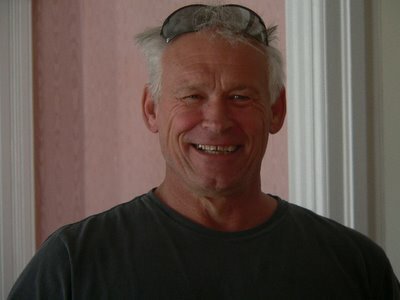 It's Dana, father of a fellow homeschooled child and wonderful garden planner. If I have a beef to pick, it's just that Dana leaves wonderful, exciting, interesting things around. Another neighbor came to the door yesterday. Things 2 & 3 escorted him to the porch, and waited excitedly to hear him. He sort of hemmed and hawwed, so I sent them off to play. "Um," he said, "Um, it would probably be fine under adult supervision, but -- "
"What were they doing?" I tried to look as though I might be surprised by anything he said, but really, what I was thinking was more along the lines of "What now?" "Um. They were throwing pitchforks." I didn't ask if they were throwing them at each other. Anything becomes a javelin to them, and I didn't think they were feeling especially homicidal toward each other. All I could say was, "Thank you for telling me. No, it's not okay under any circumstances. I'll put the pitchforks away." Maybe I should have said something about him needing to keep his eyes open in the future because I never knew what they would get into their pointy little heads to do. But I didn't want to scare him. So, when I'm done with the current pattern repeat, I'm calling my entry done. Not necessarily medal-worthy, but done. And sometimes, that's just the way it goes. But it's coming on spring, and it's all about new beginnings. See? A baby broccoli. Bees taking drinks -- right in our yard! See the little bee tongue? And I know of at least 3 babies, excluding my own, who need hats or booties or something knitted. In bigger yarn. My own baby may need a sweater to match her older sister's. 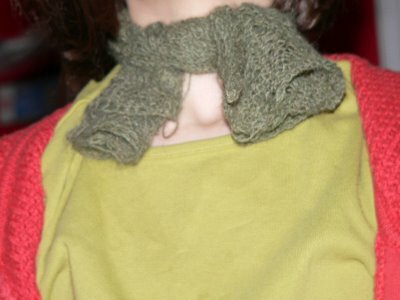 And my big girl NEEEEEEEDS that green cabled sweater, as I've been reminded. I did learn a lot from this project. I learned that I cannot use only one lifeline, but should probably use a new one every four rows or so, so that ripping back is entirely painless, no matter how much fun I'm having knitting along. I learned that I can mess up picking up stitches from that there lifeline. 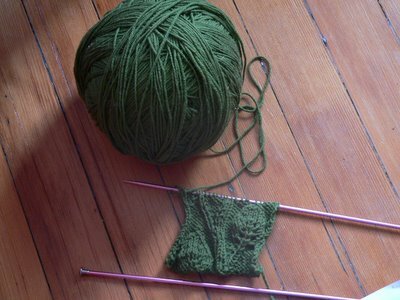 I learned that I still don't have the sort of life that's conducive to knitting teeny yarn -- unless it's just my brain. I'll figure that out in a couple of years. 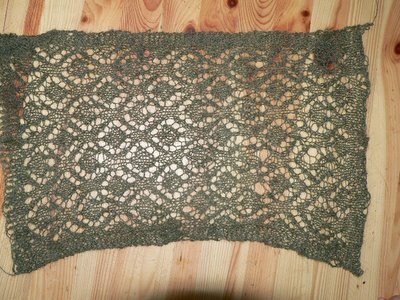 I learned that fixing errors in lace is much harder than it seems, and so I keep making "fixes" that are worse than the problems. My spouse was superdad last night, speaking of fixes. He took a horrible situation (blood, tears, shrieking) and made it into a great one, all by the application of good parenting. That's a man who gets near-immediate positive feedback. Frequently and with gusto! So here's to fixes that don't make it worse, here's to a lovely chic neck ring, wrapped so that the errors don't show, here's to finding out that lace is, well, lots and lots of fun, here's to the birds and bees who live in my yard, and the man who shares my bed, making my life just that much sweeter. Things 2 and 3, while wearing the most adorable footie pajamas imaginable, are playing a game called "Run sliding." This consists of shuffling quickly over the hardwood floor towards our very sturdy dining table, grasping the top edge, and allowing your feet to slip under the table while hanging on. In danger are their heads, should their grips loosen, and their entire bodies, from slamming into one another when they decide that going at the same time is more fun. I assume that I enjoyed limb-threatening activities like this. In fact, I will always be grateful to my mother for allowing me and my sister to perform dive rolls over the couch onto the living room carpet, but right now it makes me cringe. Oh well, no risk, no fun, right? Which brings me to my knitting. My dear friend Gordon drove on our outing today to the Japanese Tea Garden so I could knit a bunch of rows. I'm not going to post a picture, because it's boringly the same as it was, only a bit longer. What it isn't, also, is mistake-free. I was hoping to catch every mistake I made before it became a part of the fabric, and I've gotten much better at catching and fixing some mistakes. But, like the athletes who train and train and train and still fall down or crash or miss a gate or whatever, mistakes happen. 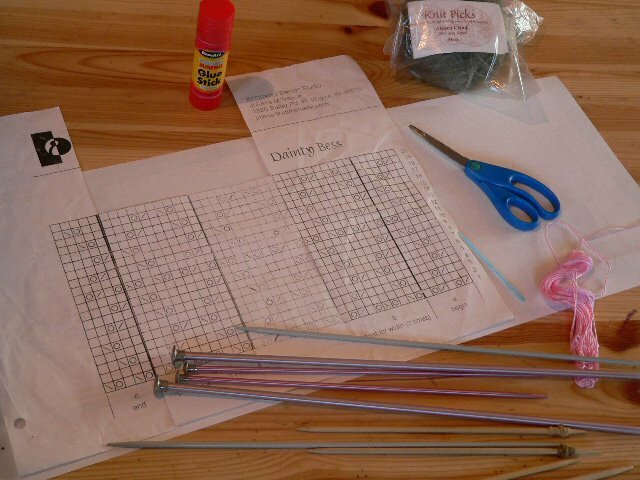 I've decided that dusting off my needles and knitting on is more Olympic than perfection, perhaps. They say insanity is doing the same thing over and over while expecting different results. My definition is housework: doing the same thing over and over and over and having the results linger for a shorter amount of time than the activity took. In my case, knitting lasts a really long time, because if I knit, on average, two rows of a 48 inch/122cm scarf at one time, intermixing bouts of housework, carpooling, cooking, bathing/holding/nursing children, it's going to take me an awful lot longer than the Olympic games to finish this object. I think Jen has the right idea. I should pretend that I never said I was going to knit a scarf for the Olympics, rather, I should redefine "scarf." Maybe "shawl for a rabbit," or "tiny headcovering for a religious woman" would be more appropriate. Or maybe I should stop doing anything else and knit more. 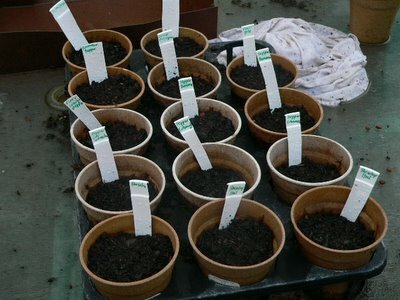 I'm starting seeds! 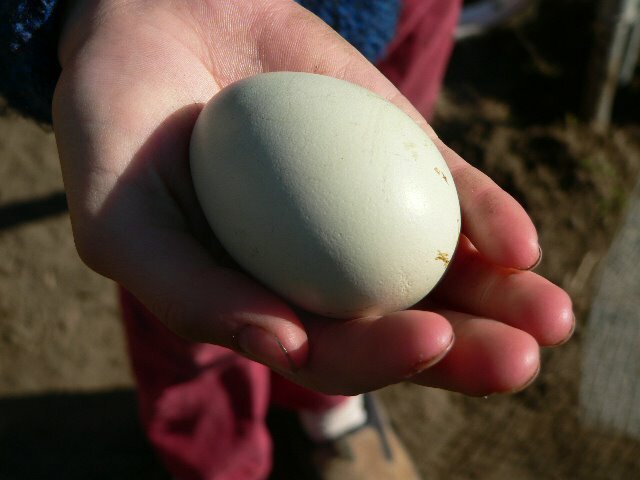 Talk about exciting and hopeful, and, not incidentally, slow like knitting (we're all about the patience here). Same garden boxes, but more of them. The little ones are for the Things. That way, they will hopefully not argue over who gets to eat what directly from the garden, and learn a bit about patience and reaping what they sow and all that. Or not. Ain't nothing like winding yarn, mmm hmmm. Now I'm going to watch individuals throw themselves down a track headfirst on a little sled, and knit. Guess we'll all find the excitement we need. After two pattern repeats, I'm by no means an easy, or comfortable, or intuitive lace knitter. I can't do it without the pattern, and as I said yesterday, I couldn't do it without those stitch markers. But I almost always have the right number of stitches when I count now, and I know how to fix a yarn over if it's only one row below. I will never, ever, forget at least one way to make a left -leaning decrease and a right-leaning one. Also, I think there's one error in the pattern. At least when I do it my way, the count comes out properly, and not with theirs, and it's the kind of error (transposed kind of decrease) that I can oh so easily see myself making. This set is about my favorite so far. The mouse on the right has a moveable tail. Now, if you'll excuse me, Thing 2 just came through with an old chicken-feed bag and asked if I had any string to make it into a parachute. I told here where it was, then said, "But, you do know, don't you, that it won't catch you if you jump from something like the deck?" And she gave me one of those looks. So I said, "Nothing you make will work for you. Rocks, toys, yes; you, no." She asked, "What CAN I make for me?" Even the suggestion that a real parachute needed height, airplane height, to work hasn't completely discouraged her. I had better not knit for a little bit. 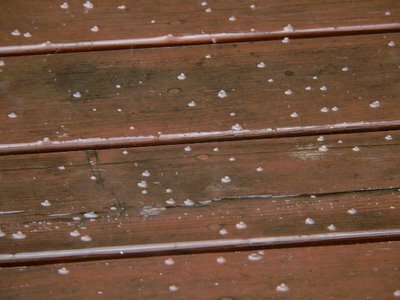 Editor's note: this was supposed to be a photo-rich post, but Blogger is eating my uploading attempts. Since I just want to move on, here it is, photo-less. I promise some when I can. Commentator 1: "We see her now, holding the needles for casting on. Notice that the yarn is a two-ply, fairly thin laceweight alpaca." Commentator 2: "Yes, alpaca. And look! She's using a knit-on cast on. Why do you think she's using that rather than another cast on?" Commentator 1: "Well, she could have used a long-tail cast on and a larger needle, but she either wants the elasticity provided by a knit-on cast on, or she wants the bind off to match the beginning edge." Commentator 2: "She's reaching the end of the garter stitch rows. If you've just joined us, garter stitch is knitting each row, front and back sides. Now, she's. . . oh, she's placing markers. Yes, she's using markers to indicate the beginning of each pattern repeat, plus the edge stitches." Commentator 1: "We understand that many of the knithletes find markers an invaluable aid when keeping pattern repeats, such as lace repeats or cables, in order." Commentator 2: "She looks like she's in trouble. She's counting the stitches as she works the wrong side in purl, and she's. . . She's off by one stitch!" Does this mean the end of her Olympic hopes?" Commentator 1: "No, see, she's taken the time to place a lifeline. That's a thread running along the stitches. See, she's tearing back to the line and beginning again. 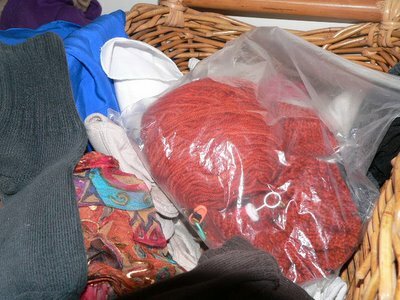 They can be a real lifesaver, heh heh, when a knitter finds a mistake." Commentator 2: "Why is she having such a hard time keeping this, let's be frank, fairly simple lace pattern straight?" Commentator 1: "While she doesn't get many extra points for pattern difficulty, she's really raking in the bonus points for level of knitting environment hazards. Seriously, she has four children, one of whom is a stuffy-nosed baby, a house that needs vacuuming on average every 20 minutes, and quite frankly, she's not that focused a knitter anyhow." Commentator 2: "Well, it's the personal challenge that counts here, anyway. 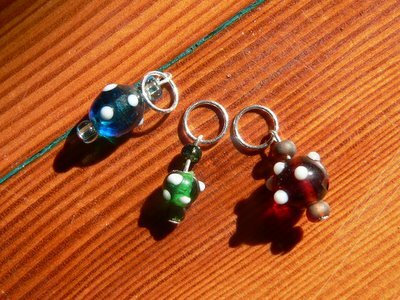 Thank goodness for those stitch markers." Confession time. I crack myself up. Since I'm not a great knitter, I find my mind wandering, and often it sounds like a bad Monty Python episode. 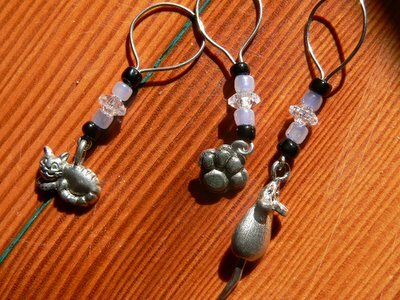 Those stitch markers, however, are just no joke. In my house, they're the color of love, because they're made specially for me by Thing 1. She started a business making and selling stitch markers last year, and I'm continually surprised and delighted at her color sense and whimsy. Knitters in our town have been snapping them up. [Commercial time -- email me and ask how you can get your very own $6.00 U.S. three-marker set. I'll act as an agent!] As I said, photos later. I did manage to watch a little bit of the competition coverage last night -- the snowboarding was new to me. As my spouse says, it's a "Hey, dude" sport. Thanks to Nona for her link to a dictionary. She cracked me up today -- go and look! Maybe I'll understand more the next time I watch. Only 10 more repeats of the pattern, and I'm done. I just might make it. If I don't go reading what other bloggers are doing, that is. Goodbye for now to the lone Jaywalker. 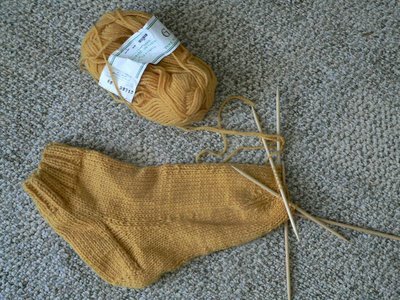 No bets on when it will either be finished or joined by a matching sock. But I am taking a few moments to pet it today, just because it finally grew by some (metrically-measured) amount. All Olympic training, such as it was, is over. Today it starts. Cue hysterical laughter, as my training has consisted of having a plethora of children, arranging it so that rolling viruses (virii?) have come through the household, I haven't slept more than three consecutive hours in a week, and pretending that I can knit more than a row without making some goofball mistake. Rounded up: a variety of needles in different sizes, for casting on and off, knitting short and long (I'm open to some flow in the process), floss, needle, pattern, yarn. The pink embroidery floss and the blue needle (focus problems thanks to the camera-strap-grabbing baby) are there because I know myself. Mr. Lifeline and I are going to become pretty close friends, I think. Notice that I've actually made a mock-up of the pattern, complete with repeats glued across the middle. Anyone operating on as few synapses as I am needs all available external help . I'm going to find some magnets and use our metal "make a word" boards to keep track of where I am. I'm also not showing the remote for the TV. I warmed up last night by watching a videotape of Elizabeth Zimmerman and Meg Swanson cheerily knitting a percentage sweater. It reminded me that life is long, there's a lot to learn about knitting, and making something beautiful will eventually last longer than even my childrens' snotty noses. String Bean had an excellent suggestion in the comments yesterday, and I quote: "It would be horrible not to have time to knit every day (EVERYDAY!!). But I don't have children, so I'm probably missing something. Teach the kids to knit! Once they get the hang of it, you can finally sit down and knit (a few months later...) while they quietly sit still and knit. Quietly...while sitting still. No noise. Maybe? Yes, it really is a great idea. Two of my four can knit, and two of them are probably too young. Well, at least the seven month old one is. She, however, really enjoys chewing on yarn. And the knitters? There is almost nothing my children cannot do while talking. Really. At any rate, I don't mean to make my situation with my children stand for anything more than one person's life with four small people. And my idiosyncratic small people at that, too. Somewhere there is a family with four or more children the ages of mine, and this family probably has lots of time to knit. Heck, they probably have time to meditate. All of them. Calmly. Together. For whatever reasons, nature, nurture, bad karma, a life well-lived, I have the children I have. And right now, that means that I don't have purt near any much time to knit during the day. I take the time I do have, and I try to make as much time as I can, but I do knit rather slowly, given my "knit two, rip one" credo. Plus, it's not all bad. The kids are diverting, sometimes more than diverting, and I read while nursing. So, those Jaywalkers? 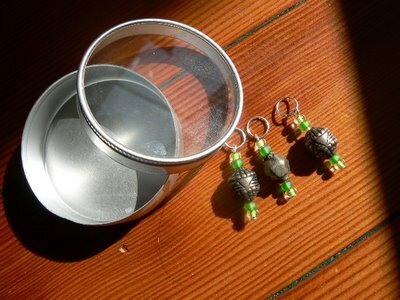 They're now about 3" or 7.5 cm (I'm going to stick to metric from now on; it seems so much more). Green sweater? Well, I've got ribbing. This evening's knitting time? Please accept my apologies for the quality of the picture. It had been a long day. 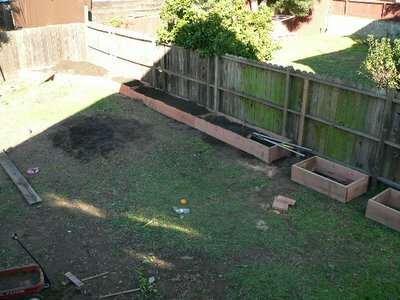 Just about half of my new garden beds are there. Enough to drive me to my seed boxes and pencils and whip me into a gardening frenzy. 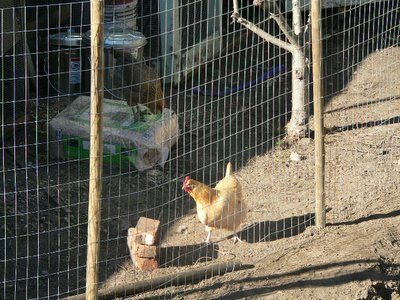 Plus, the ladies are now behind bars. 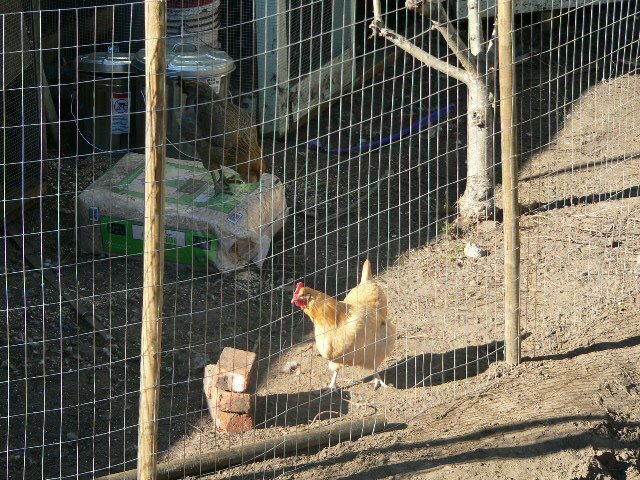 I can plant without fear of chicken depredation, being used as a landing perch by the overly friendly hen, or inadvertently encountering. . . well, poop. Even with only a smidgen more sock, it all adds up to a good day. My children seem little worse for wear today -- maybe they worked out all the psychological harm I inflicted on them yesterday through imaginative play. I haven't yelled at them yet today, despite Thing 3's screaming insistence that I "Make pancakes NOWWWWW!" I cut that fit off by gently setting down the bowl of hot cereal in front of him and walking off. My kids seem to operate on the "food on the table is worth a thousand fits" method, and once he'd eaten, peace was restored. Okay, that plus two readings of Jan Brett's Armadillo Rodeo. In a row. Now they're in the bathtub. Expiation? I hope so. Busy day today, with lots of running around (and, I fear, little knitting), so I'm going to go ahead and meme. My internet friend bfmomma tagged me. She and I "met" almost 11 years ago, when we were both expecting our first children, on a due date list. We've been bumping into each other on email lists ever since then, and now, bwaaa haaa haa, she's knitting. Um. . . "Raising Arizona"
Ummmm. Nope. No more. Don't like the over and over thing. Nope. I like it here very much. I would rather be knitting, though. Everyone I know well enough to tag has already been tagged! Screams have just erupted from the bathroom. It started as such a nice day. It wasn't raining, first off, so that was a very good thing. We got up, ate, did some schoolwork. . . the baby went down for her first nap . . . aaaaaannnnnnddd, I went upstairs to the playroom. 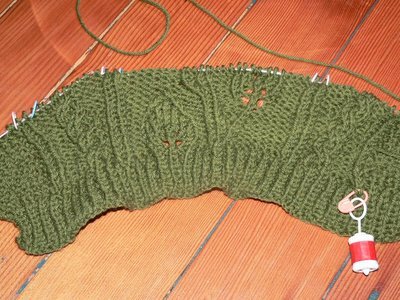 I hoped to get a lot more progress done on both -- I wanted to finish most of the leg of the Jaywalker and to get into the pattern on the green cable sweater (when is a "cable sweater" an "Aran sweater?" Does it have to be cream? From Ireland? Who knows?). At any rate, when I went upstairs, and noticed just how much mess was up there, I started to get unhappy. When I noticed not one, not two, not even three but four rotten apple cores, strewn around the computer desk, I really started to lose it. The addition of some of my "special things" (believe you me, I have very few of these) taken out of the yarn room and played with was just sauce. So all of us then had to pick up together, not just a few things, but ev-er-y-thing. Cue crying, yelling, fighting, accusations of slackage: "It's not fair! I'm doing it all and they're not doing anything!" My favorite was when Thing 2 shouted at Thing 1, "You're making me talk so much I can't get my breath!" I did my share of yelling, I'm sorry to say, and even intimated that if they were going to treat the room as a sty, we might as well put pigs in it. Needless to say, it wasn't a great time. It got worse when a friend of theirs showed up to play while her parents, who are landscape installers, worked on our back yard. I had to tell her that they couldn't play until they were done, because by this time, all the stomping and yelling had woken up the baby, which is nearly a capital offense. Being kept away from their friend only heightened the already-high levels of distress. 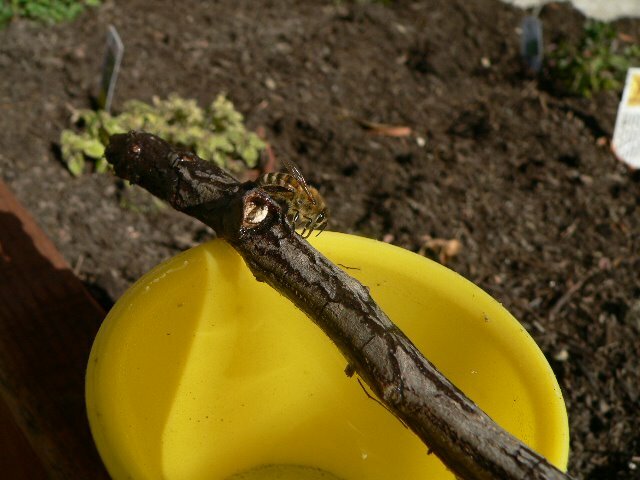 Finally, after many tears, many fights, me thinking both that I was really tired of this and that maybe I'm just not cut out to, you know, rear children, and far too many rotten apples, it was near enough to "clean" to spring the kids. They ran out like puppies from a cage. Another friend came over -- yahoo! Now there are four children, ages 4-6, romping through the house. The baby was awake, so it was just loud, not criminal. They started a long game complete with costumes and stuffed animals, and I was just sitting down to breathe when I hear one of my beloved darlings say screech, " "Hey!!! Do you want to play babies and evil Mommy?" It would be the height of understatement to say that I haven't been knitting much lately. Actually, to be completely accurate, it would be more the case that I haven't been knitting anything I've kept lately. 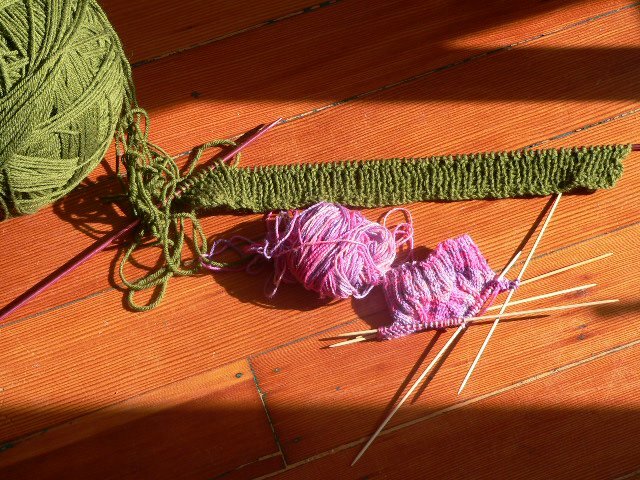 I'll knit, then rip, then knit, then discover I've messed up the pattern repeat again,* then rip, so on and so on. I don't even have impatient suitors to make it a reasonable thing. I'm just in a slump, I suppose. Thing 3 is still sick enough to require a bit of my attention, and the littlest Thing is still an in-arms babe much of the time. I'm generally okay with all of this, really I am, but it doesn't do much for my concentration. This "concentration" isn't much to start with, if history has anything to show about the present. Let me tell you a little story. About a year ago, I figured that I could start early and knit slipper socks for my sister and her wonderful husband for Christmas. (We'll call him "Sven.") I found a pattern I liked, knit my sister's up, and began on his. I knew they had to be larger than hers, but I didn't know how large. I couldn't ask him for his measurements, because then he'd know I was knitting socks for him. I didn't think I could just wing it, but I didn't know what to do. So I asked my sister to estimate his size, and she asked if I needed measurements. "Yeah, that would be good," I said, "Can you measure his feet while he's asleep?" "I could undress him while he's asleep," she said, which struck me then, and continues to strike me now, as pretty funny stuff. Nice, huh? 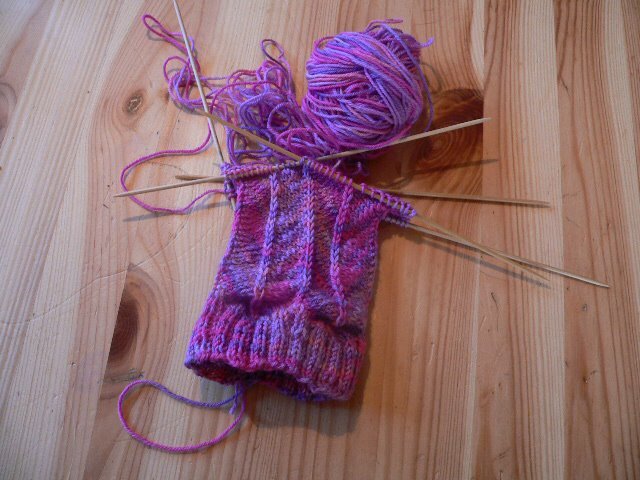 But I didn't remember how many stitches I'd grafted together on the tip of the toe of the other sock. Was it 12? 8? I set off to find it and compare. Not hard, right? Except, the Other Sock was nowhere to be found. Look, I'm pretty disorganized (anyone who can knit a "pair" of socks that takes nine months isn't completely on top of her game), but I only had three children when I knit the first sock. And my knitting stays in one general place unless it's actively being worked on, and that sock wasn't there. I think I probably put it away "for Christmas," feeling all ahead of myself. Only I forgot to tell myself where I was stashing completed gifts. We tore the house apart. No sock. Since I took that picture today, I can confidently say that having another baby and moving house didnt' magically cause wherever that sock was/is hiding to disgorge it. I still believe, in the face of all evidence, that it's somewhere in this house. And I'm not grafting that toe until I find it. Why do I believe, in the face of all evidence, that the sock still exists and is in the new house? I could say it's because I don't want to knit another one. And there is probably some truth to that. But it's more along the lines of similar incidents resolving themselves. 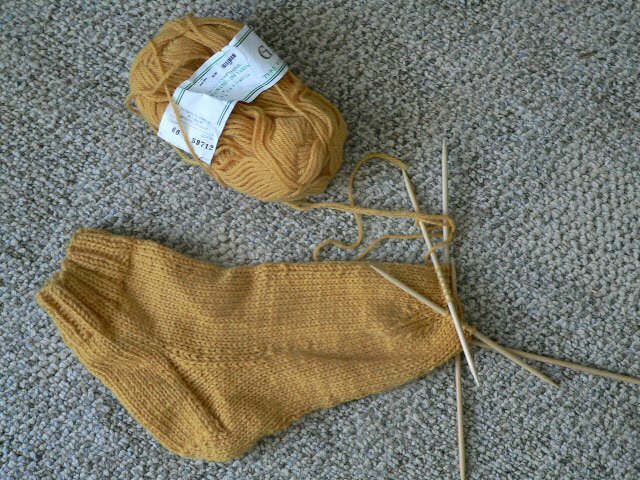 I haven't knitted the Jaywalker socks; I haven't done more than three inches of the green Aran for my daughter (and those three I ripped out); and I really haven't knit on the orange vest. (Dainty Bess awaits the Olympics to start). At first, I didn't knit on the orange vest because I didn't want to mess it up -- I'm not going to outgrow it, there's no completion date hanging over it, it can wait. Instead of panicking, I just knit (and ripped, and so on) on my other two Sisyphean tasks projects . I knew that vest would show up in good time. Or not, like the sock. But then I went hunting for some tights in a corner of my closet. Yeah. I don't know what it was doing there, either. *Both my friend and the wonderful authoress of the pattern helped me work out why I was not able to knit the Jaywalker pattern. Suffice it to say, the problem's not in the pattern, just this operator. I was going to post the saga of Sven's slipper sock today, but Grace invited the knit blogging world to this event, and I have just the piece. I wonder if anyone else will pick this particular poem? But first, a digression: I grew up being "all about" literature (that's lit-ra-chur, not just "books I like"). I studied it, I devoured it, I wrote tedious papers about it. All that said? It was all about novels. Poetry, not so much. In fact, in my first high-level poetry class, all I could figure to write about the assigned work was how little I understood it. I ended up getting an A, so that may tell you something about the state of higher education. Or not. At any rate, every once in a while, a poem sneaks under my defenses and hits me square between the eyes. Maybe it's a famous poem, although being a poem-phobe, I wouldn't know it, maybe it's not. This one does it for me. Still. Every time. After feeling like I had no business holding needles the other day, I did what any sensible knitter-with-problem does: I asked other people for help. The wonderful denizens of the knitty board nailed my issue, as did the lovely pair over at Yarn. I used some of my babysitter time to get help. When I got it, I returned home because the baby was awake, and headed out to apply my new knowlege. That knowlege is -- inc 1 does not make 1 equal. I now pause for the titters of amusement rippling out in the universe. Well, yeah, I could have read the instructions. Or I could have assumed I knew what I was doing and ended up messing it up. I kind of like it. But that's all I did. 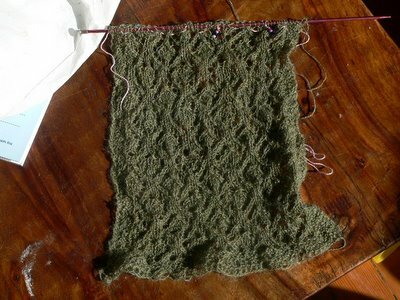 Why, you wonder, did I not immediately complete some bit of knitting beyond swatching? Well, I'm basically a housewife. I also educate the young ones in my household, but all of the house duties mostly fall to me. I also am a housewife who hasn't slept in about three nights due to various members of the household being sick. Last night, Thing 3, of the cloggy ear canals, had a quick-onset ear infection. Between him literally waking up screaming in pain, my spouse getting up to blow his nose, Thing 2 having a screaming nightmare in the middle of the night, and the baby waking up just because she's a baby. . . well, you get the picture. I'm feeling a little ragged. Today, we've been to the doctor (burst eardrums plus fevers warrant visits in my book), gotten the necessary meds, done a load or two of laundry, run the dishwasher, gotten the baby to nap, set up all the kids under a blanket in front of a movie, and made my bed, and I finally feel as though I can exhale. I'm going to swatch the second cable for the sweater. And I'm going to ignore my creeping suspicion that I don't actually have enough yarn according to my kitchen scale. I did the thing where I paid out enough yarn to register on the scale? And then I measured that, and weighed the whole ball, and did the math. . . well, we'll see. It's old yarn. I think I got it from my knitting teacher in Tennessee, and she had probably had it for a while. Maybe I can find something to match well enough if it comes to it. I'm also going to ignore the fact that I'm still the only knitter in the known universe who is having actual trouble with the Jaywalker socks. 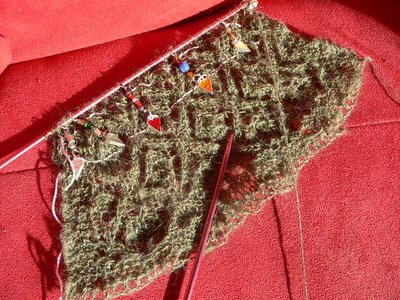 I should probably count the stitches on my needles, just to make sure I actually have the right number, but I have to have something to blog about in the future.